Traditionally, red is the symbol of happiness. For centuries, the Chinese have taken great pride in producing beautiful silk ribbons. 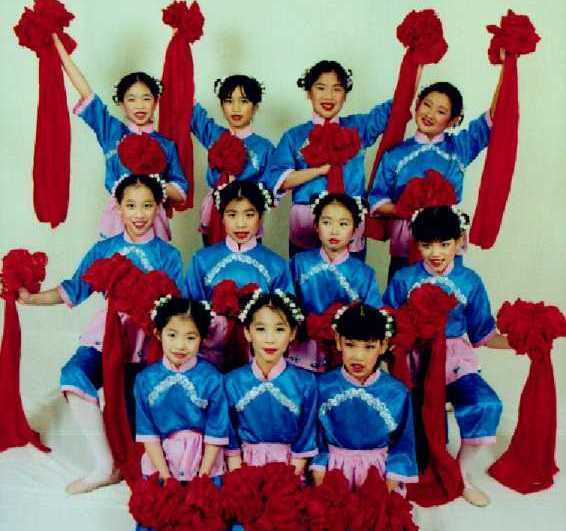 The Red Ribbon Dance originated from Chinese opera, and has been preserved since the Han dynasty. 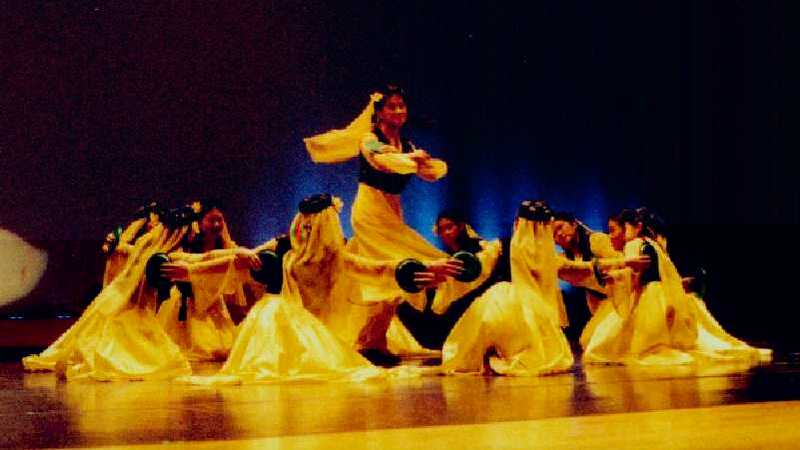 It has become a traditional dance to perform during festivals. 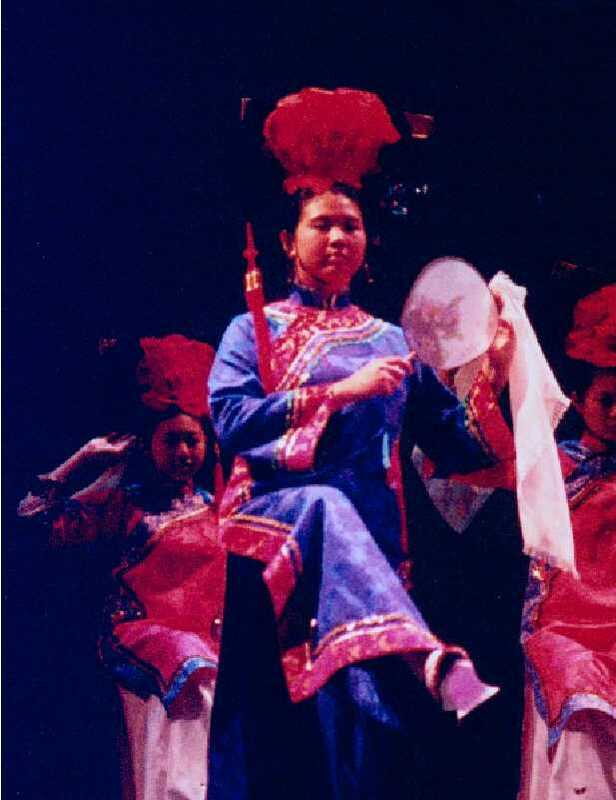 This classical dance originated from the Jiang Nan folk dance, and was later performed in the palace during the Jin, Sui, and Tang dynasties for about 600 years. This dance was excerpted from the dance drama Along the Silk Road and has been re-choreographed. The dance maintains the Dun Huang style. Lotus represents purity. It is highly associated with Buddhism. 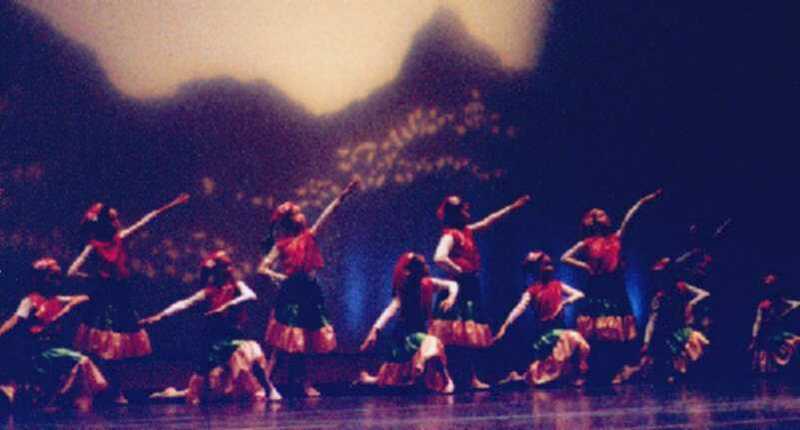 It depicts the lotus fairies dancing in heaven with Dun Huang style. A mountain girl carries hats and fans walking down from the mountain. She meets a group of monkeys on her way. The monkeys take away all of her hats and fans, which makes the girl angry. Nevertheless, the smart girl thinks of a way to take back her hats and fans. 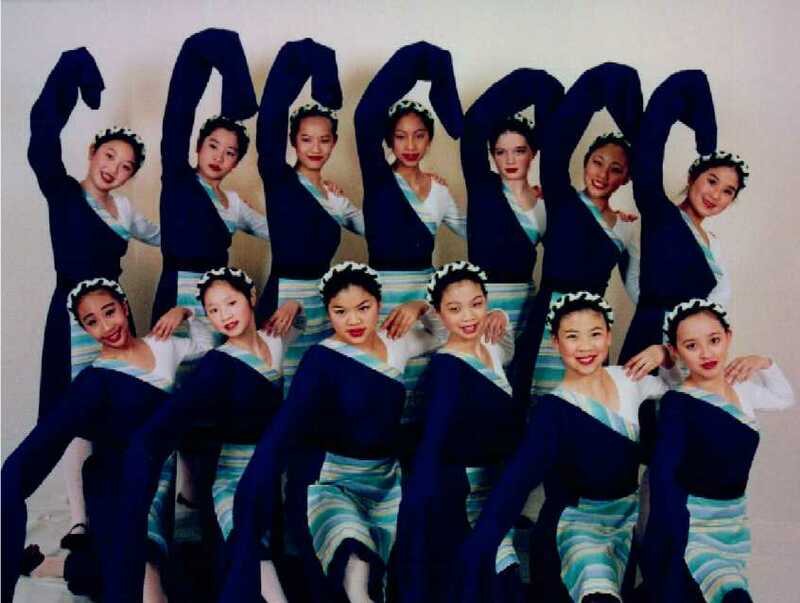 The choreographer of this dance was inspired by Buddhist engravings in the Dun Huang grotto during the Tang dynasty. The five celestials represent the vastness of the heavens and the grace of flying goddesses by manipulating billowing lengths of silk as they glide over the stage. The population of the Yi is one of the larger ethnic groups among other minorities in China. They mostly live in the Yunnan province, although some live in Gui Zhou, Guang Xi, and Si Chuan. The Yi have their own tradition and culture. They like music, dance, and wearing multi-colored clothing. CHINESE CONTEMPORARY BALLET "HAPPY NEW YEAR"
Chinese contemporary ballet is a new style that has developed in the past forty years. 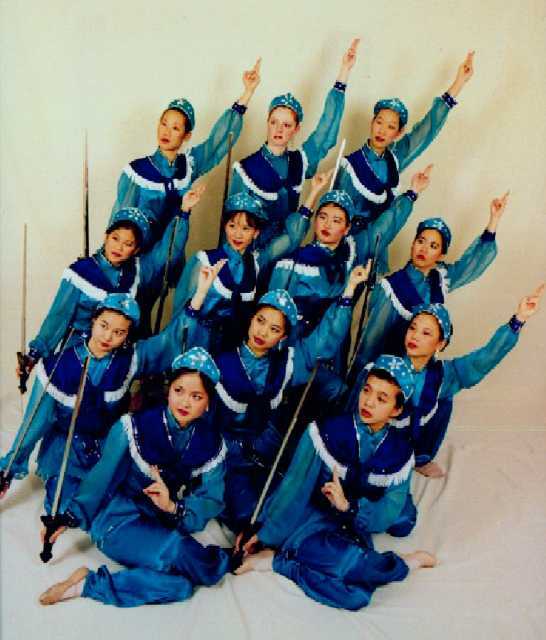 It incorporates classical ballet technique into Chinese dance style. 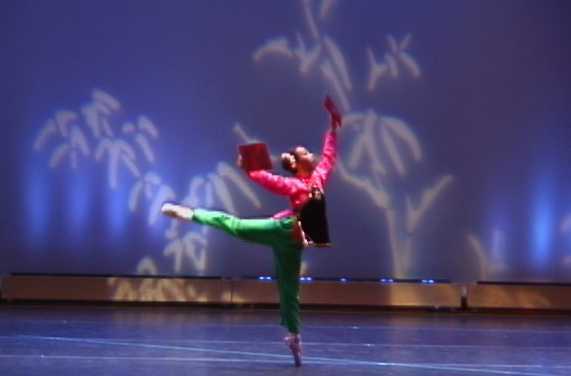 Originally, this dance is an excerpt from a famous Chinese ballet drama The White-haired Girl. 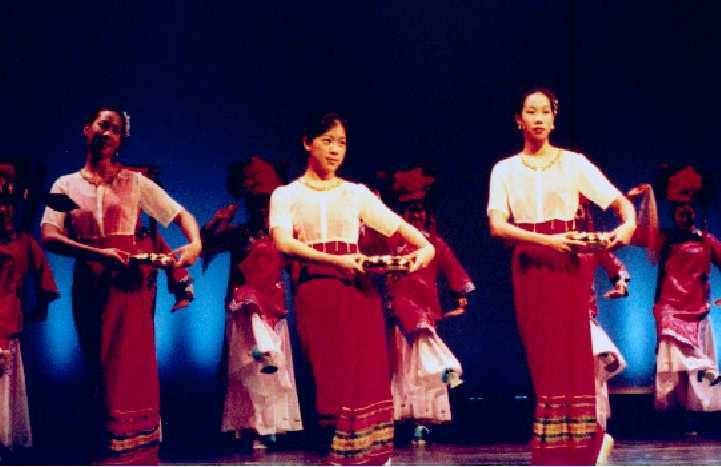 The dance depicts two girls celebrating Chinese New Year. Xin Jiang is located at the northwestern part of China. Wei Wu Er is the name of the ethnic group who loves music and dance. 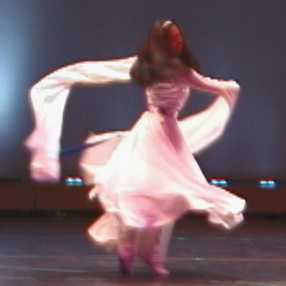 The dance style has its unique characteristics, especially the flexibility of the wrist and neck. This is a dance about a group of Han children watching Chinese opera on the street in front of their Grandma's house. They happily compete for a space in the audience while imitating the performers. This dance comes from the Shanxi Province Children's Arts Troupe. 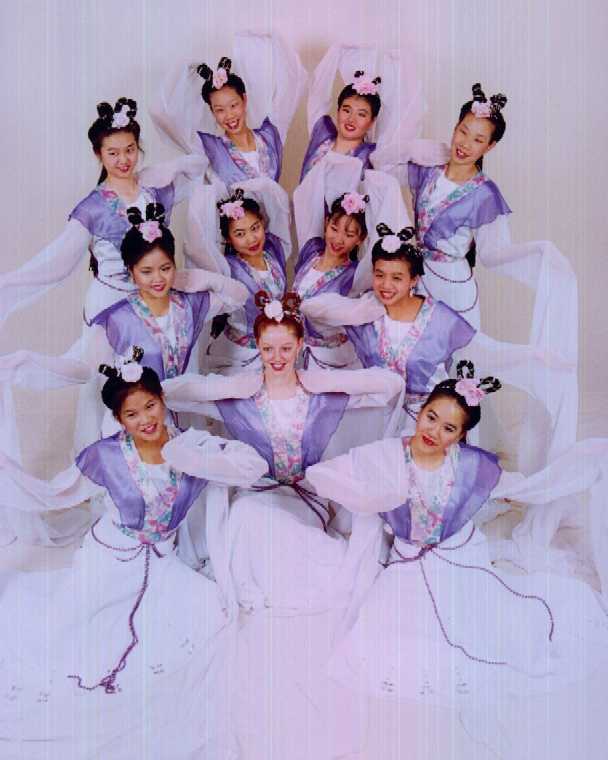 This dance is a popular Yang Ge that was inherited from southern China. Yang Ge is the traditional folk arts of the Han. Even though different styles of Yang Ge are influenced by different areas of customs, they all mostly express the feeling of joy. The most popular props used for Yang Ge are the fan and scarf. Historically, sword was a type of weapon. After many years the sword technique gradually developed into a dance performance. Sword Dance during the Tang dynasty was already quite advanced in technique. Movements from the Sword Dance are forceful but elegant. 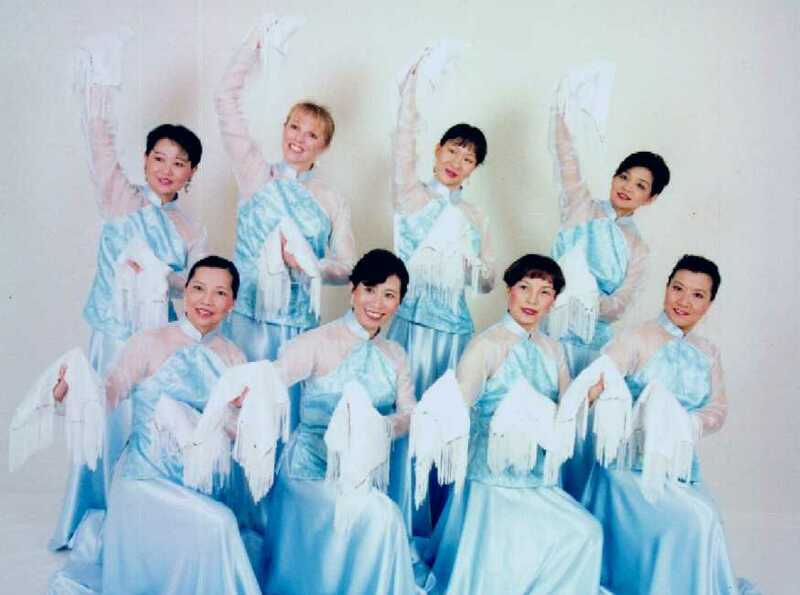 This dance is choreographed based on traditional Dong Bei Yang Ge (Northeastern handkerchief) techniques to portray the beauty of the snowflakes floating down from the blue sky. 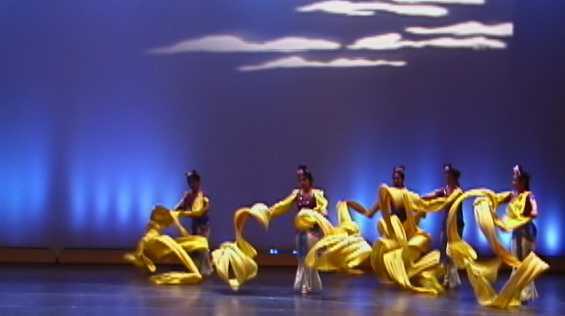 This dance is choreographed with a traditional Chinese costume and a famous classical tune (The Water of Yangtze and Yellow Rivers) coupled with contemporary dance steps. A mix of old and new brings out the expression of lament and sorrow with the long sleeve costume. 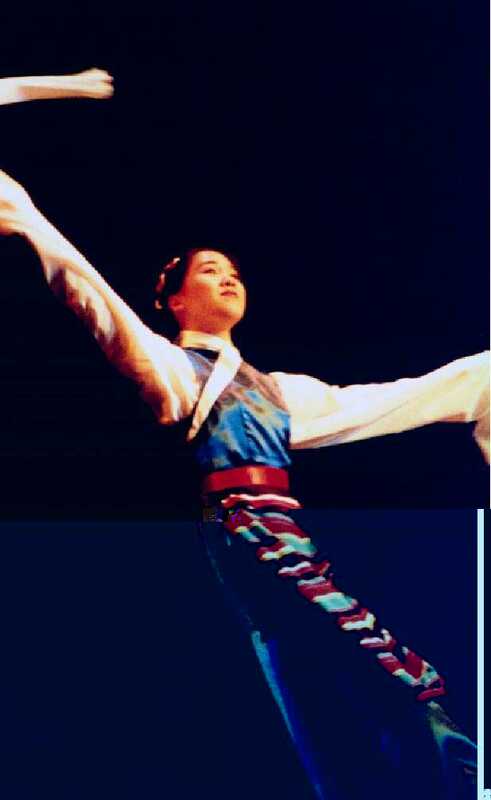 This dance is performed by Hwee-Eng Y. Lee, the artistic director of the Atlanta Chinese Dance Company. Most Tibetans live in the westhern part of China in places like Qing Hai, Yunnan, Gan Shu, Si Chuan, etc. Two groups of Tibetan girls are coming down from the snowy mountains. They are dressed in traditional long-sleeved costumes with colorful aprons. The characteristics of the dance include bouncing knees, tapping and brushing the floor. Their happy life is reflected in their song and dance. 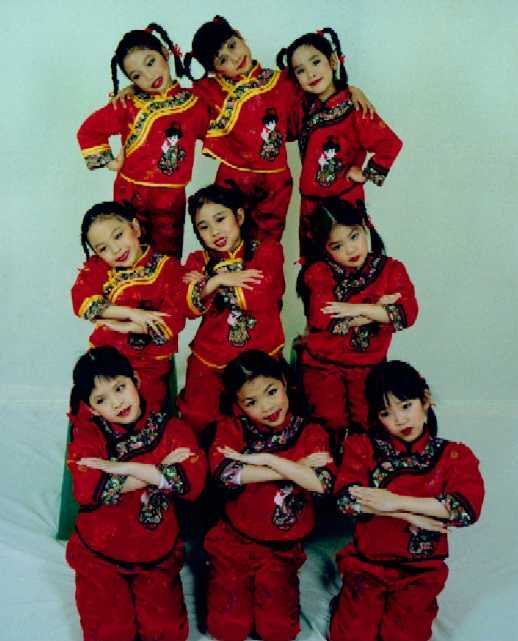 This dance comes from Hui Li Xiao Ying Xing Dance Troupe. The Qing was the last dynasty in Chinese history. The Manchu people who have very elegant costumes ruled it. It also has a great influence on Chinese costume history. 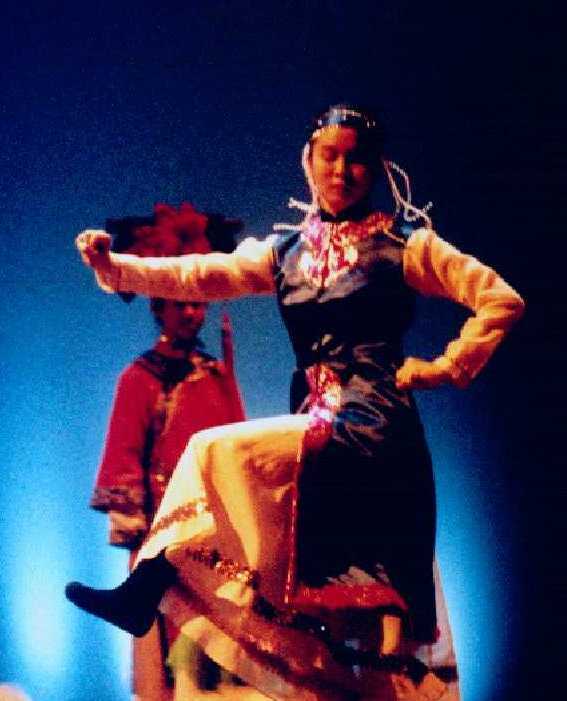 The Manchu people are unique among the Chinese for their particular style of headdress and platform shoes, which makes them very different from other ethnic groups. 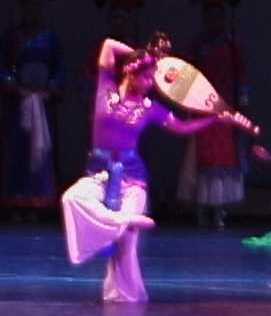 This is a Wei Wu Er dance from the Xin Jiang province. The variation comes from Beijing Dance Academy. 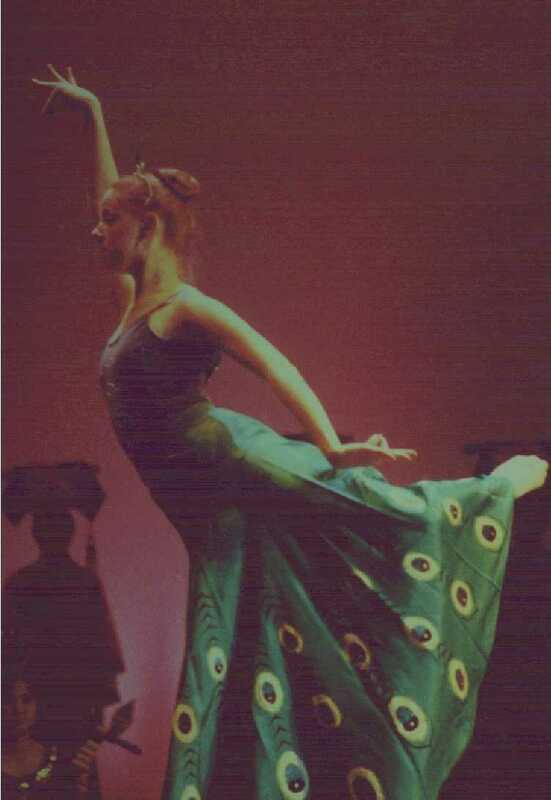 The choreography of this graceful dance was designed to accompany a classical tune of the same name. It features two ladies who dance under the moonlight and express their yearning with the gracious movements of the feather fans. For five thousand years of Chinese history, Dun Huang music and dance from the Tang dynasty was one of the most prosperous periods in arts history. 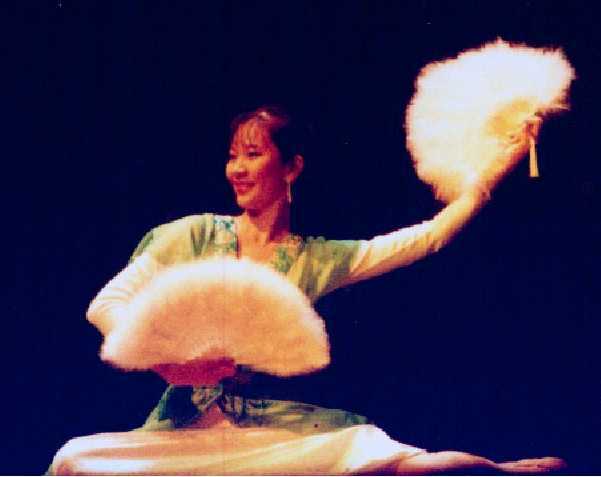 The classical Dun Huang dance style has its influence from India due to the introduction of Buddhism to China. The image of the dancers on mural painting from the past has shown us the unique Dun Huang style in Chinese dance history. 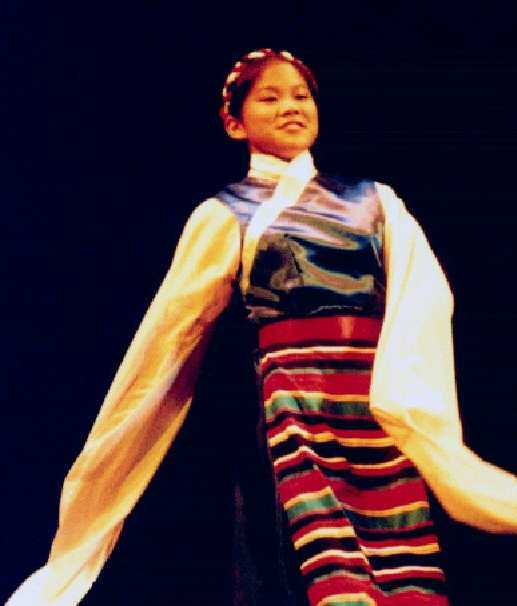 Most Tibetans live in the westhern part of China in places like Qing Hai, Yunnan, Gan Shu, Si Chuan, etc The characteristics of the dance include bouncing knees, tapping and brushing the floor. Their dance reflects their happiness in life. This dance originated from the Dai people who live in the Yunnan province. During the celebration of water sprinkling festival, you will see people use buckets or basins to pour water on each other. It is believed that the more water one is splashed with, the happier one will be. This dance originated from the Dai ethnic group, who lives in the Yunnan province, in southwestern China. The peacock symbolizes happiness and good luck. The graceful peacock is depicted drinking water, bathing, and flying. Mongolians live on the vast prairie in the northern part of China (Inner Mongolia). Vigorous and energetic movements characterize this dance. Some of the movements also show horseback riding.